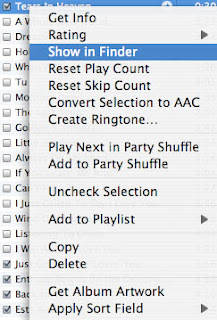 Steps to create custom ringtones using iTunes for the iPhone. Requirement, iTunes version 7.5 or above, iPhone Firmware 1.1.2 or above. The screen dumps are in Mac OSX, but can also applies in Windows OS. 1. 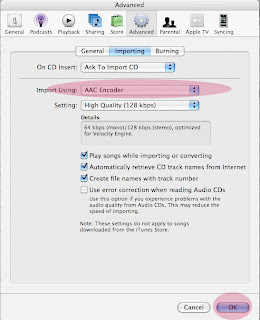 Ensure iTunes -> Preferences -> Advanced, Import Using is "AAC Encoder"
3. 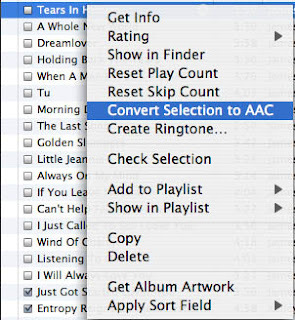 Right Click the same song in iTunes Library and select "Convert Selection to AAC"
4. 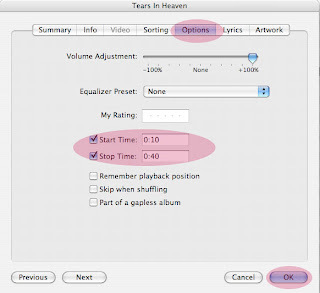 After converion a new song will be created in iTunes Library with the same name but the duration is the selected range in step 2. You can goto the "Recently added" playlist to find it, it will be on the top of Recently added. 5. Right click the newly created song and select "Show in Finder"
Remember the name of the ringtone cannot be too long, less than 15 characters is OK, otherwise the ringtone cannot be synced to iPhone. 8. Goto the song that you have selected in step 2 and reset the Start and Stop Time. 9. Connection iPhone and enable the sync ringtone option, then the custom ringtone will be in the iPhone. If you find this info useful, please consider to $1 by clicking the Donate button. i got itunes 7 i think thats what it is its the most update 1 and the iphone 2.0 and i did this but it doesnt sync the ringtone any help? Yes thanks you for your script !! !